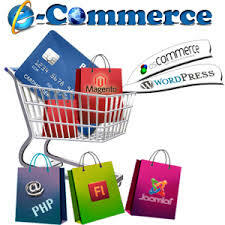 E-commerce applications E-commerce is conducted using a variety of applications, such as email, online catalogs and shopping carts, EDI, File Transfer Protocol, and web services. This includes business-to-business activities and outreach such as using email for unsolicited ads (usually viewed as spam) to consumers and other business prospects, as well as to send out e-newsletters to subscribers. More companies now try to entice consumers directly online, using tools such as digital coupons, social media marketing and targeted advertisements.